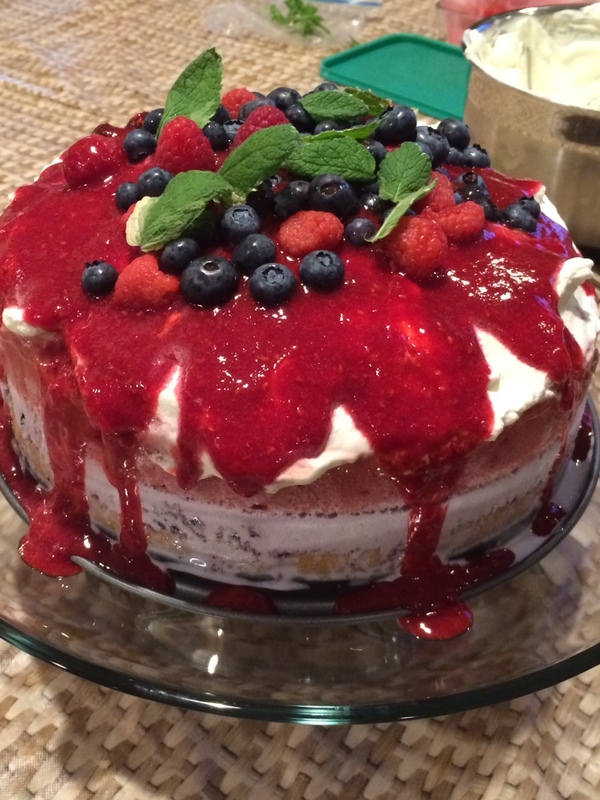 I made the Berry Ice Cream Cake (officially called Red, White, and Blue Ice Cream Cake) for, what else, the Fourth of July. It was so yummy! It was really easy too. I did make a few modifications. Even though frozen pound cake would be easy, I had the time to make my own. I halved the Joy of Cooking recipe, and even then had plenty of pound cake left over. Hooray for extra cake! I also made the raspberry sauce in advance – it was an easy thing to get out of the way. You can see from the picture that we didn’t skimp on adding the raspberry sauce. I debated skipping the raspberry preserves step. Adding raspberry preserves to raspberry sorbet seemed to be just too much, but in the end I’m glad I did it. In the carton the raspberry sorbet is more of a pale pink color, and the raspberry preserves really gave it a richer red. As with any ice cream cake, it needs to be eaten quickly! Luckily it was, and there were hardly any leftovers! I recently made this cake for the husband of a dear friend who is about to deploy. 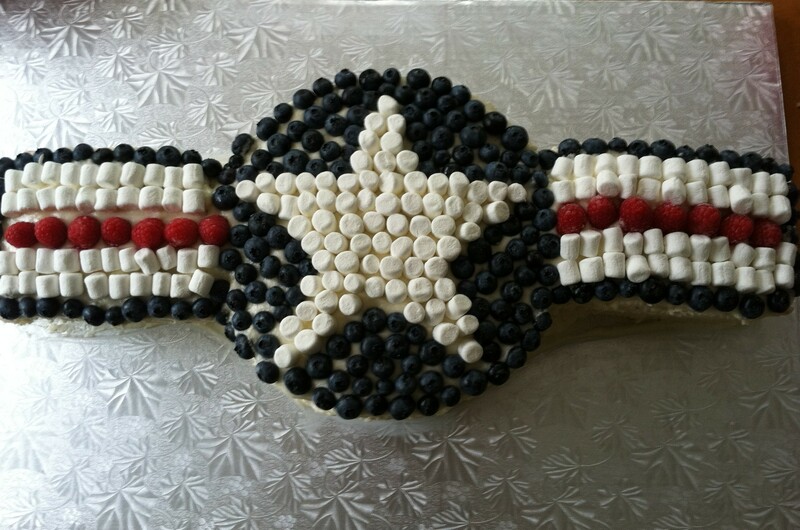 The cake is based on the Air Force roundel symbol. Since I was transporting the cake on a three-hour drive, I used marshmallows rather than white chocolate chips or white M&Ms. Any of them would be delicious. I definitely recommend using the optional raspberry liqueur in the filling recipe. The filling was so good I ate the leftover with a spoon! I tried Giada’s white frosting recipe. It was tasty, but a little bit runny – I had to add about ¾ cup more sugar than the recipe calls for. I also had to make 3 batches for a cake this large. On the whole, I was pleased with how the cake came out, despite the summer heat and travel challenges. I would recommend using this design rather than the more common USAF logo with wings – it’s much easier.